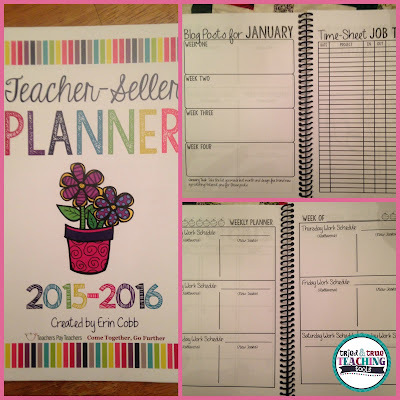 Thank goodness for Ashley at Schroeder Shenanigans and Angie at Lucky Little Learners for hosting their 2gether We Are Better linky party: Plans & Goals for 2016. Our (own) kids don't give us much choice but to spend lots of time together and do things with, since our lives revolve around their schedules. And I do love spending time together and planning kid-friendly outings, etc. However, my poor hubby is often a little neglected (I'm sorry!!) So my goal this year is to be intentional about our grown-up date nights and putting them on the calendar. MY PLAN: Have you discovered The Dating Divas yet? Oh my goodness, they are a fabulous group of wives and mothers who have The. Most. Creative. and fun ideas for not only family dates, but grown-up date nights! Their mission is: "Strengthening marriages, one date at a time." They have freebies, printables, a store. . . I gave my husband a Passport Around the World, where I've scheduled a date a month, each one on an airline ticket with destination (for example, flying to India. . .we'll go out to an Indian restaurant, etc). The passport came with clipart to use as country stamps; it'll keep me thinking and will ensure we spend time together regularly! Be sure to check them out! My TpT goal is to create more products!! I have so many ideas in my head or lessons I've already created and used with students, but it takes me SO long to make them "TpT ready." Anyone else have that problem? I know they are good, tried & true teaching tools, but they need covers and explanations and cuter clipart, blah, blah, blah. . . So I need to be intentional and not procrastinate about my TpT business! To do this also, I need to schedule my social media interactions, as well as sit-down-and-work time! MY PLAN: I'm going to use the amazing planner from Erin Cobb (Lovin'Lit). She laid it out so perfectly and generously gave them to TpT'ers in her session in Vegas, and I haven't used it yet!! (since July!) Ugh! So no more excuses! Lastly, my personal goal is to try my hand at scripture journaling. If you've never heard of the term, it is basically choosing a Bible verse and as Erin Leigh says, "The best way to start art journaling is simply to start. Choose a scripture that you love and doodle to your hearts content. Keep adding lines and dots and more lines until you are finished." Easier said than done! Check out her GORGEOUS work on Pinterest. I followed her 31 Days to Scripture Journaling blog posts and even bought all the supplies, but then froze and never started! So MY PLAN is to go back through those posts and just start! I tend to be a perfectionist and do NOT think of myself as artistic, so I just didn't start at all. 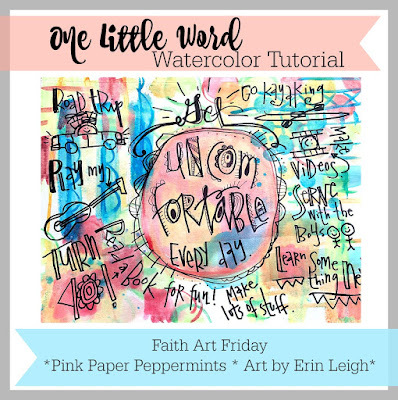 Lucky for me, Erin Leigh & Melissa from Pink Paper Peppermints will be continuing their Faith Art Fridays blog posts!! Come join in the fun!! So here are MY PLANS and goals for the year!! Of course there are tons more mini-goals in there, but I need to keep remembering to focus!! 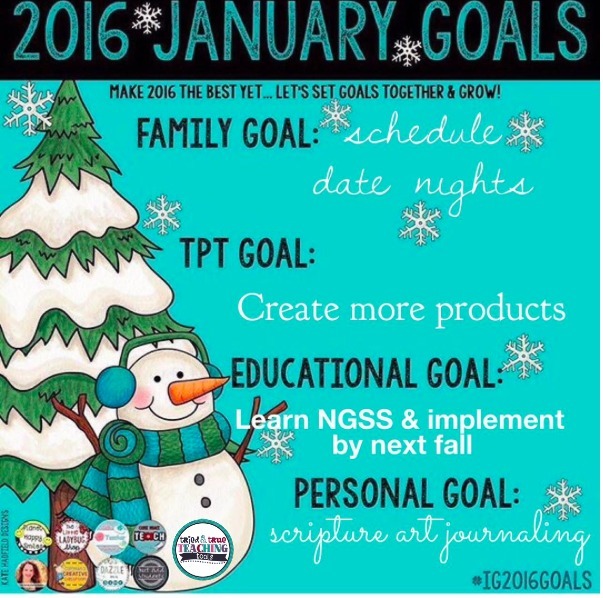 Now click on the picture below to read about more teachers' goals and plans to help motivate you! Happy New Year!